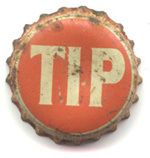 The TIP Corporation of America was started by Clay F. Church on July 18, 1944. Church was at this time the president of the Dr. Pepper Bottling Company of Marion, Virginia. Besides their regular assortment of soft drinks, the Dr. Pepper Bottling Company was producing an excellent grape drink called Tip Grape. Clay felt he could make money if he owned the rights and could franchise the drink to other bottlers. Clay purchased the drink from the Gary Beverage Co in Charlotte NC and began to look for other bottlers to sell the beverage. To separate the grape franchise portion of his business from the main bottling activities, he formed the TIP Corporation of America and felt his new drink could compete favorably against Grapette, a popular drink from the 40s. Two of the earlier franchisers for TIP were Charlie Gordon's TriCity Beverage and R. B. 's Pepsi-Cola Bottling Co of Fayetteville, NC. Just as TIP was getting started, the US joined WWII, and sales were down and TIP was starting to have some problems. By 1945 Clay had his hands full managing the Dr. Pepper Plant and decided to hire Bill Jones to manage the Grape Drink side of his investments. Jones had many contacts in the area from his days as salesman for the National Fruit Flavor Co. Jones had worked with, and sold flavor extracts to, concentrate companies and had also touted his flavors to regional bottlers like Hartman Beverages (see also MOUNTAIN DEW), the Minges Brothers in North Carolina and Tri-City Beverage. When Jones took over the helm, the company was in heavy debt and before long Clay was forced to declare bankruptcy. Jones, however, had a lot of faith in the Tip Corporation and on August 28, 1957, he set out to refinance the bankrupt company. He needed capital and sought out and was able to secure four investors who, along with himself, would put up $1500 each. Part of the $7500 raised by the partnership was used to pay off two of Clay's unhappy investors, Buddy Forester and Charles C. Lincoln. The five equal owners were: Bill Jones (President), Wythe Hull (Secretary, and also the President and owner of The Marion Virginia Pepsi-Cola Bottling Plant), Ally Hartman (Hartman Beverages), Richard (R. B.) Minges (President and owner of Fayetteville NC Pepsi Bottling Plant) and Herman Minges (President and owner of Lumberton NC Pepsi Bottling Plant and brother of Richard). Also in 1964, John C. Klett, Jr. was Vice-President of the Tip Corporation, but appeared to have no financial interest in Tip. They also issued 840 shares of stock, with each investor getting 140 shares of Tip Corporation and the company holding another 140 shares in reserve. Other records indicate that 240 shares were held in reserve for a total of 940 shares. Just exactly how Tip acquired the rights to Mountain Dew is an exclusive piece of information. Charlie Gordon states that he worked directly with Ally Hartman, on behalf of Bill Jones (Ally and Jones were not getting along at that time, and Jones asked Gordon to help him to acquire the rights to Mountain Dew, and Gordon being a good friend of both men, agreed to negotiate the deal) and that Tri-City Beverage actually purchased the rights to Mountain Dew for $5000 and then turned around and sold the rights to TIP Corporation for the same $5000. And then Bill Jones states that when Ally bought his share of the TIP Corporation, he threw in a dormant trademark, Mountain Dew, and that he and his brother owned the trademark and had not developed it in any way other than to bottle it as a mixer for their personal entertaining, transferring the trade-mark ownership to Tip Corporation . Regardless, it is officially known that the rights were acquired by the Tip Corp on November 30, 1957, three months after TIP restructured. Also it is known that Ally Hartman only kept his shares in the Tip Corporation for 2 years, offering 20% to his son, Bernard, who had just returned from the military tour. But Bernard was not interested in the bottling business, and Ally sold his shares directly back to the Tip Corporation, which decided to give 100 to Bill Jones for his hard work and dedication, and the remaining 40 was put back into the company reserve. The major business of Tip Corporation was making concentrates for bottlers, selling Tip Grape and Mountain Dew were just sidelines. It was a good idea that the franchise sales were not the only money maker for Tip, as Tip Grape had virtually vanished from the market by 1960. And Mountain Dew was not doing well either, as over four years after the investors had acquired the rights to Mountain Dew, and two years after Tri-City Beverage had changed the flavor, Tip only had a handful of distributors. Tip had a successful marketing strategy to develop flavor concentrates. It was a four step process. First, a bottler would give Jones an idea for a taste that they had in mind. Second, Jones would work with the bottler to develop the flavor. Third, Tip Corporation would then "own" the flavor because Jones kept the "secret" formula. And fourth, the bottler agreed to buy the concentrate exclusively from Tip, a safe bet, because Tip was the only one knowing how to make it. Tip Corporation continued to operate until it was purchased by PepsiCo September 2cd, 1962 and then operated as a subsidiary of PepsiCo until December 30, 1965 when PepsiCo acquired all the assets of The Tip Corporation and took over direct operations, keeping only Mountain Dew. Jones requested a 'clear' million for the rights to the Mountain Dew formula, which ended up costing PepsiCo around three million in total, plus the cost of a Mach IV. His daughter recalls that that Mach IV became Jones' prized possession, and that he had purchased personalized license plates reading "Mountain Dew" with the figure of a man playing golf on it.